I walked slowly forward, hoping for a better view. Suddenly, the jungle opened up and there he was. 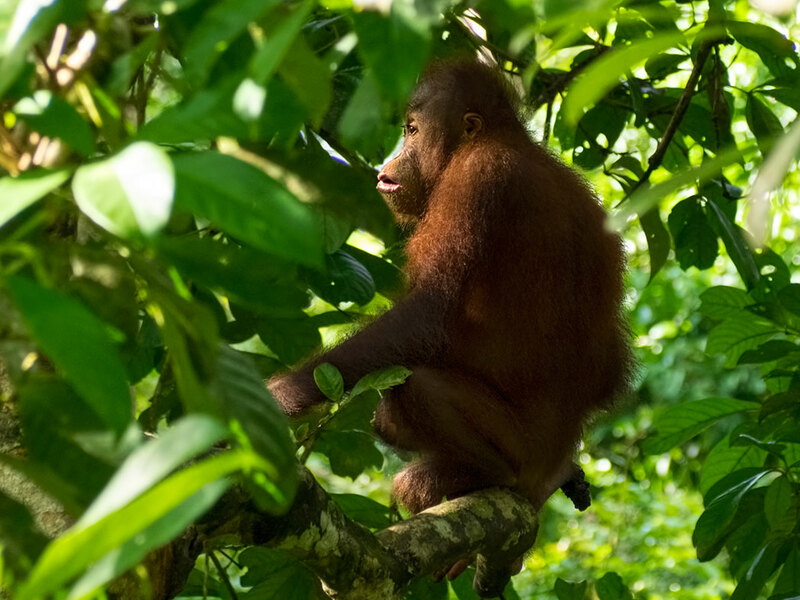 A solo orangutan, sitting placidly on a branch. With mouth half open and unfocused gaze, he seemed to be deep in contemplation. I wondered what he was thinking. I wondered if he even knew I was there. I wished I had eyelashes as pretty as his. Or, given those gorgeous thick eyelashes, maybe it was a “her.” I will never know. I took a photo, lowered the camera to check out the image, and when I looked up again, he/she was gone. I hadn’t heard a sound. If I hadn’t taken the photo, I’d still be wondering if it really happened. We hope Orangutan can survive to live in this world as long as he can ! It was such a “lucky” chance that you captured an Orangutan then it disappeared as fast! The Sepilok Rehab center is so natural. It’s a wonderful place Lydia. Thanks so much for your comment. I love how you capture your excitement at getting a fleeting glimpse of a wild animal so many of us are fascinated with. Fantastic that you got the great photo, for yourself, and to share with all of us. Thank you. Very beautiful picture. Hola from Mexico.